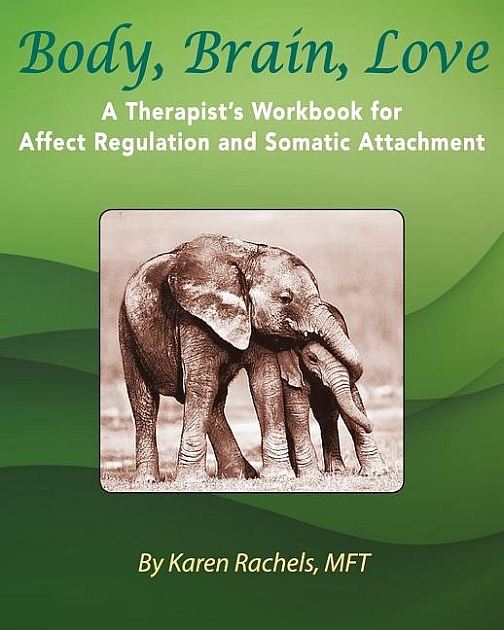 Karen Rachels' "Body, Brain, Love: A Therapist's Workbook for Affect Regulation and Somatic Attachment," is a first-of-its-kind contribution to the dynamic and unfolding world of body-brain integration. This workbook accessibly integrates three critical areas of therapeutic work brought to us by the Decade of the Brain: 1) brain-based attachment theory, 2) the neuroscience of affect regulation, and 3) practical somatic skills to grow clients' brains. Therapists have the opportunity to view their own experiences through the lens of neuroscience including their own dysregulation and how their attachment strategies interweave with the attachment strategies of clients. By offering a more experiential and somatic way to absorb the information, learning is easy and immediately applicable for therapists seeking to effect transformation with clients. This book bridges mindfulness and neuroscience-based self-help books with the more academic, didactically-focused books for therapists. It uses a self-help format but is, in fact, for therapists. Post-tests, charts with clarifying exercises, specific self-focused exercises, games, case vignettes, and a complete session transcript all facilitate learning in both a cognitive and experiential manner. The author has brought this vital information to therapists in a style that easily teaches practitioners necessary and effective 21st Century skills which enhance compassion and self-compassion, and create authentic therapeutic relationships.